As I work with leaders in organizations who are making the transformation from a traditional way of thinking to Lean Thinking, I hear many stories about lack of leadership commitment. That seems like a fuzzy problem so I ask people how to make it concrete and real. The answer I get is people want to see evidence of leaders at Gemba daily, leading and involved in problem solving. A few weeks ago I wrote about the first excuse – lack of time. If you want to refresh on that excuse, please see our blog dated January 12, 2012. And yes, change is hard but as leaders we need to step up to the plate and lead the organization towards True North. But why is even a change for the better, so hard to implement? I’m not an expert in organizational design by any means but I observe that organizations have an inertia to them. Much like Sir Isaac Newton, the great English mathematician, physicist and astronomer described as the first of his three universal laws of motion – “A body in motion tends to stay in motion unless acted upon by an external force”. In organizations we tend to perpetuate those things we’ve learned and practiced over the years and it requires energy to overcome that inertia. The role of leaders is to be the force, that source of energy, that changes the inertia of the organization. In adults it takes a great deal of energy to replace what we’ve learned and done in the past with something new even if that something new is better than what we already know and do. We have to practice over and over again. It takes repetition and with repetition we build the muscles of the organization so it gets a little stronger every day. The key is to make time to go to Gemba every day. Over time the repetition becomes a habit and the organizational culture begins to change. As leaders - what you do is what you get. This is the water ring model of change. 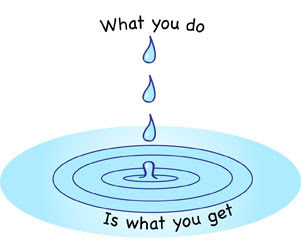 Start in one area of the organization and the change spreads across the organization like ripples across a pond. But it needs to be reinforced continually to overcome to inertia of the organization. Is it hard to transform a culture and implement Lean? Yes, but by going to Gemba every day and starting small, the culture will change faster than you think is possible. On the other hand, experts say that it takes, in average, 21 days to develop or change a habit. So, what about giving the benefit of the doubt and start making gemba walks tomorrow? We may talk again within 3 weeks! Excellence is a habit as are the virtues, both which we learn through repeated practice. When this practice is tied with a PDCA loop and strong coaching, excellence can quickly flourish. 21 days is a great challenge.